You may not have a ton of control over where you live and where you work, but one thing you likely can change is making your commute more active. Squeezing in some physical activity on the way into work can help improve your mental cognition and ability to focus, as well as boost your energy and productivity for the day ahead. An active commute home not only gives you the chance to detach and de-stress so you can truly relax as soon as you walk through the front door, it's also a great way to fit in a workout without adding yet another thing to your to-do list.. Wondering how you can make your commute more active? It might be easier than you think. First things first: If you want to ease into an active commute, it helps to dress the part. 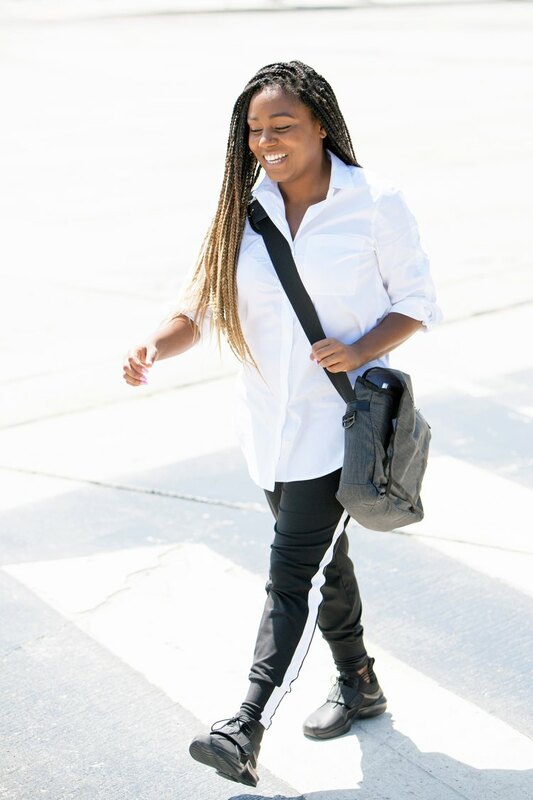 Clothes made with performance fabrics that stretch and wick yet still look polished when you arrive at the office are key if you want to seamlessly go from home to work without dragging around a gym bag with a change of clothes. Read on for our recommendations. Assuming the distance between your home and your workplace allows for it, walking can be an energizing way to start your day (not to mention money-saving if you're saving on gas or public transporation). Plus, there are health benefits to a regular walk to work: Research shows it can cut your risk of high blood pressure and diabetes by 40 percent. 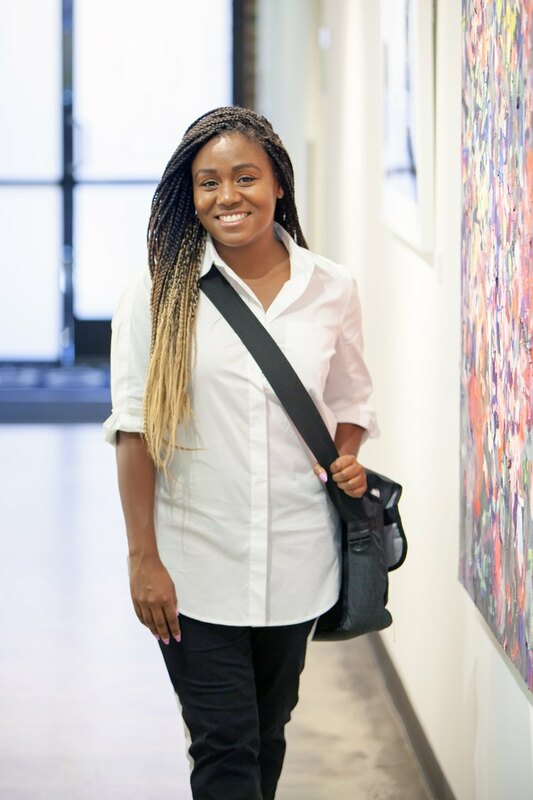 So lace up those walking shoes, and make sure you're wearing a quick-dry top or tee made of breathable, sweat-wicking fabric to avoid any unsightly sweat stains once you arrive at the office. According to estimates from the U.S. Census Bureau, nearly 900,000 people cycled to work in 2017 (compared to almost 300,000 in 2006). And it's no wonder now that cities like Fort Collins, Colorado, and Wausau, Wisconsin are investing in bike-friendly infrastructure. 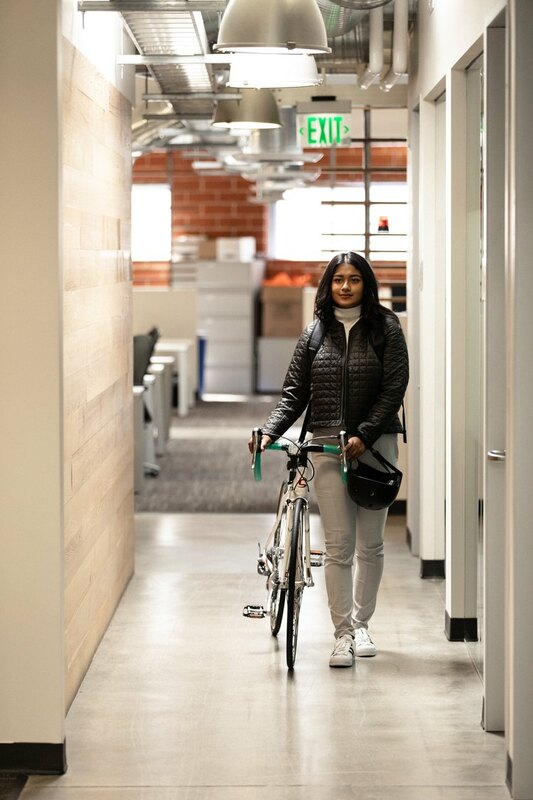 Moreover, research shows that cycling to work was associated with significant health benefits including a 46 percent lower risk of developing heart disease and a 45 percent lower risk of developing cancer than people who didn't bike to work. Plus, there are few things as invigorating after a long day of work than hopping on your bike and whizzing home on two wheels. If your city has plenty of protected bike lanes and bike traffic signals, why not give it a try? 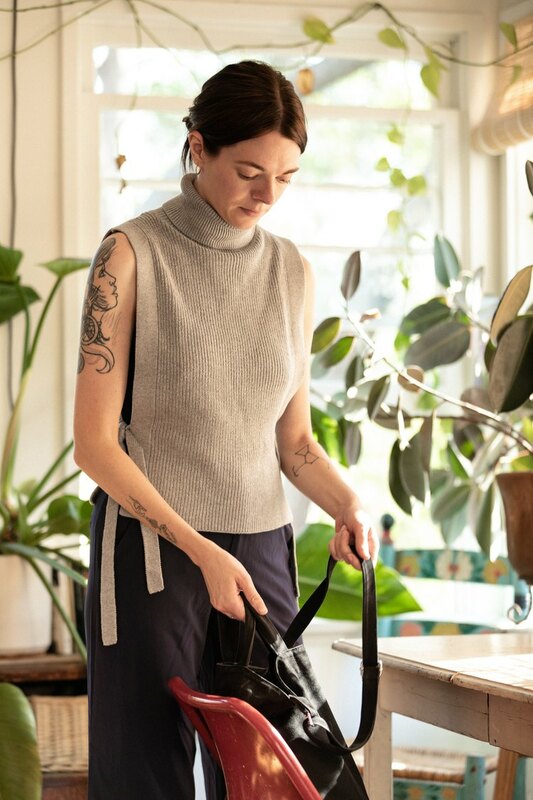 Just be sure you've got on pants with plenty of stretch and a slim leg shape so the material doesn't get caught in the bike chain; these will get you to work and looking put-together throughout the day. And don't forget your bike helmet (preferrably one that has plenty of ventilation vents to help prevent helmet hair). You don't need to commit to going all the way on foot or bike, especially if you live an hour or more from work. 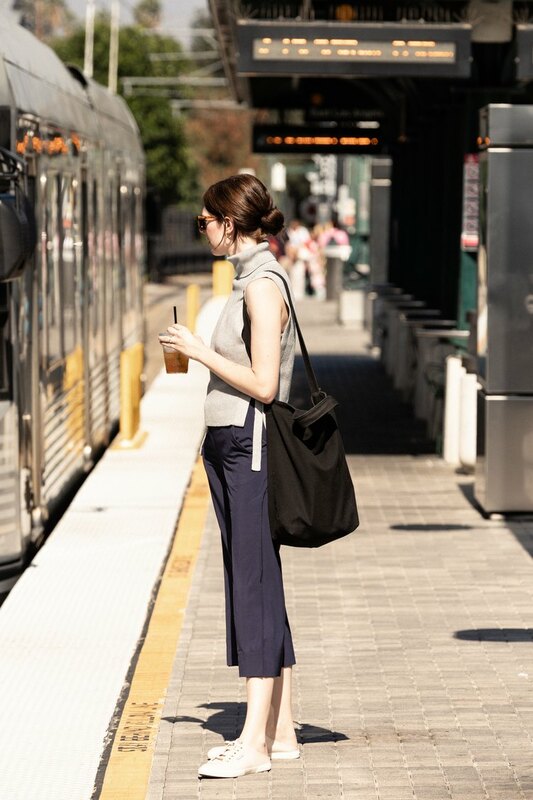 According to the American Council on Exercise, one study found that people who took the train walked an average of 30 percent more each day and were four times more likely to achieve the recommended 10,000 steps. LIVESTRONG.COM Content Editor Ada Ciuca walks to the train most mornings, which she says helps to start her day off right. "I get to spend the time I otherwise would getting frustrated about traffic doing productive things like reading or listening to a podcast." In other words, she actually enjoys her commute. Sounds relaxing, right? Pro tip: Choose water-resistant layers — this jacket is perfect — so in case of a sudden rain shower on your way to or from the train, you don't arrive at the office completely drenched. If you absolutely need to drive to work, there are still plenty of ways to make your commute more active. Try some physical exercises you can do while behind the wheel such as pelvic tilts, glute squeezes and bracing — just make sure to keep your attention on the road. Or, practice mindfulness during the drive — for example, switch off the radio, become aware of any tensions in your body like gripping the steering wheel and relax. By the time you arrive at your destination, you'll be more calm and refreshed. Keep in mind: Research shows that the clothes we wear influence our behaviors and attitude, which means, that if you choose something like tights that can be dressed up with a blazer by day, you'll feel like getting your move on all day long and will be more likely to stop at the gym on your way home. All in all, getting active during your commute is about turning the least awesome part of your day into a time that's enjoyable, rewarding and yours. And with so many health benefits you have nothing to lose (except for some of that work-week stress) by giving it a try!